Ok, not really any toil or trouble, but definitely lots of bubbles. 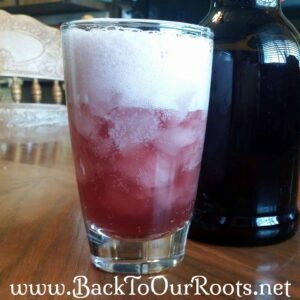 I’m talking about water kefir (pronounced KEY-fur) today, which is an amazingly bubbly and thirst quenching brew you can make at home. 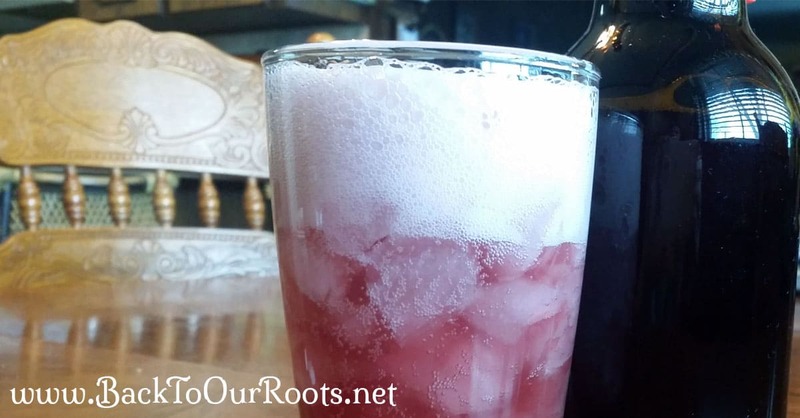 It’s a naturally carbonated beverage that’s full of probiotic goodness. You can leave it plain. Or you can flavor it with fruit or juice. If you want your kefir to have a lot of carbonation you will need to invest in either bottles and a capper (available here ), or flip-top grolish-style bottles (available here ). Both of which are made to withstand the buildup of pressure from the carbonation. If you don’t want to invest in bottles until you decide if you really like it or not, you can always use canning jars. 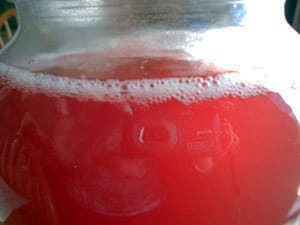 To make water kefir you need water kefir grains. 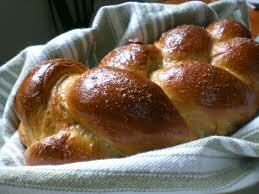 There are also milk kefir grains, but they are not interchangeable. I’m not really sure why they are called “grains” because they have nothing to do with wheat-type grain. Perhaps it’s because “grayish-white, rubbery, blobish things” doesn’t sound very appealing? 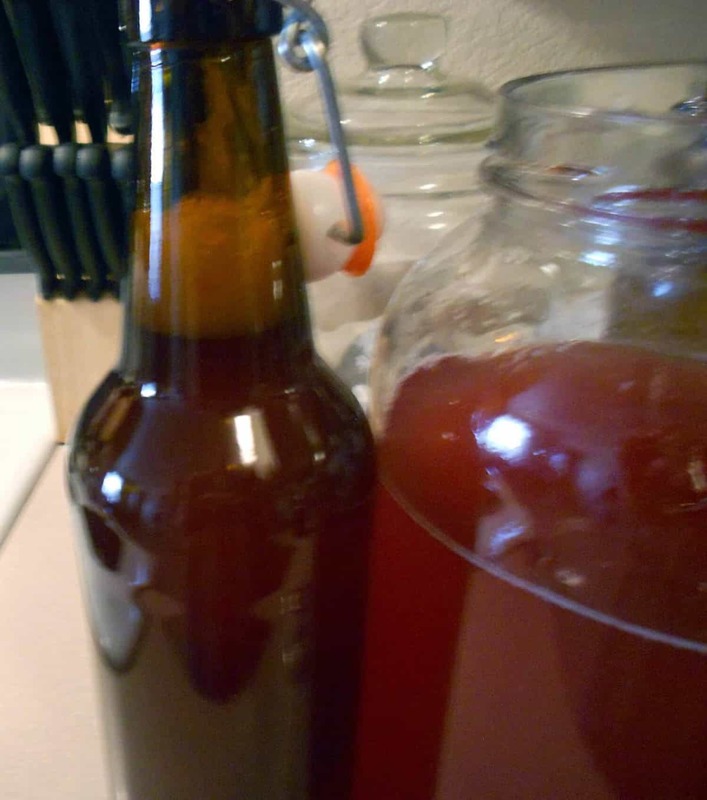 Regardless of the name water kefir grains are much like a SCOBY for brewing kombucha. 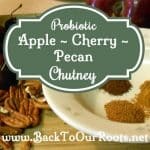 They are clusters if beneficial yeasts, bacteria, and enzymes that create a probiotic rich beverage that helps to replenish the good stuff in our digestive tracts. 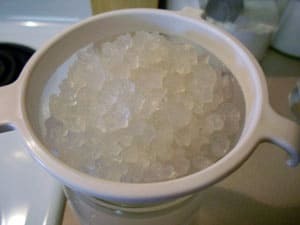 Kefir grains can come either frozen and ready to use, or dehydrated. You can order those here . If yours are dehydrated, follow the instructions that came with them to rehydrate before you make your first batch. 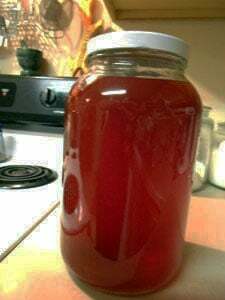 Water kefir grains will multiply in the right environment, so after you get the hang of it you can pass along your extras to a friend. 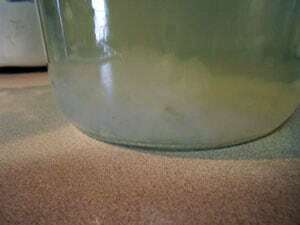 Water kefir grains are happiest in a mineral rich environment. Some people add well-rinsed pastured egg shells to the jar during the brewing process. I prefer to use mineral drops, mostly because I can’t seem to remember to not throw my shells into the compost bin. The brand I like is Concentrace and you can order that here . 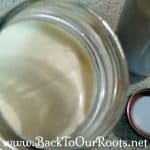 I make my kefir in a gallon jar and that makes enough for about a week for me. My favorite time to drink it is in the afternoons when I used to reach for a sugary soda. It helped my kick my Dr. Pepper habit. And I love the bubbles! 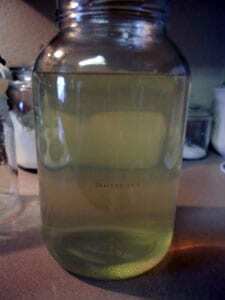 Water kefir is a fermented beverage. If you allow it to ferment too long it becomes an alcoholic beverage. 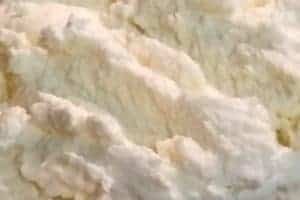 Normally, your kefir will have less alcohol that a piece of over-ripe fruit, but it’s best not to forget that you have some brewing. 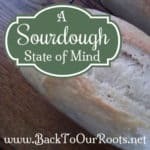 The other note is that you need to keep your kefir at least 5 feet away from any other ferments or cultures, including your sourdough, to prevent cross-culturing. Ok! 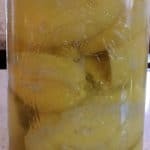 So let’s learn how to make water kefir! 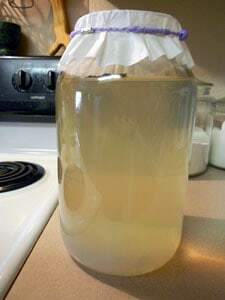 Then pour the plain water into your gallon jar until it’s about half full. 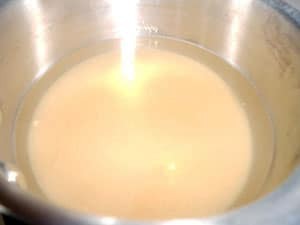 Add the sweetened water and stir. Now continue to fill the jar with plain water up to the shoulder. Make sure the water has cooled before you go to the next step. You can either just toss them in the jar like I do, or you can put them in a muslin bag and toss that in. If you use a bag, make sure that it is big enough to let the grains multiply. 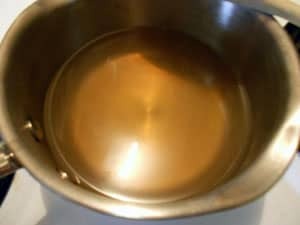 Now take a coffee filter or clean cloth and cover the top of the jar. Use a rubber band (or hair scrunchy) or some twine to secure your covering. As the fermentation process commences, the grains will convert the sugar to gas and some alcohol. The covering is to allow the gas to escape during the first fermentation as well as keep the bugs and dust and curious kitties out. Now set the jar in a warmish place (75°F to 85°F is ideal) and let it brew for 24 to 48 hours. The warmer it is the faster it brews. Taste it at 24 hours. It should be much less sweet than when you started. Keep tasting it until the sweetness level is to your liking. It shouldn’t take more than 48 hours, but occasionally when it’s really cold in my kitchen it has needed a little longer. At this point, you can bottle it and let it sit for another 24 to 48 hours to build up carbonation, or you can flavor it in a second fermentation. I usually put a plastic strainer in the top of another gallon jar and just pour the kefir into the other jar. Then I fill the jar to within an inch or so of the top with organic fruit juice. You can also use fresh or frozen fruit. If you use fruit, you need to change it out every day. Now put the lid on the jar. If it doesn’t seal well, put some plastic wrap over the top first before you put the lid on it. Put it back in the warm place to brew some more. After 24 hours check for carbonation and taste. If it’s bubbly and tastes good to you, transfer it to your flip-top bottles. I like to put about a tablespoon of juice in each bottle before I fill them with kefir. Make sure that you leave about one to 2 inches of head room in each bottle. leave room for more bubbles! Sounds delicious! 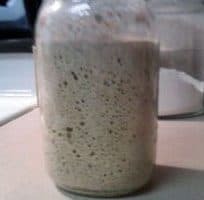 I’ve made milk kefir and love it, but I want to get some water kefir grains and try this! DO oh then throw the used grains away? Or can you continue to use them? Hi Cynthia! That is a great question! After you remove the grains from the first ferment, you keep them. You can either start a new batch right away, or you can store the grains covered with sugar water in the refrigerator. As long as they are given new water every few months they will continue to work.